To complement our adjustable front LCA, we have developed an upper control arm for the front to suit those track junkies out there or those just looking to safely add some negative camber. Intended for extra grip, our "Track-Spec" is 100% TIG welded, has an oversized outer bearing cup and adjustable inner rod end mounts. Before ordering please forward any setup questions or concerns to FIGS customer service so that we can make sure these are the right fit for your desired use case. 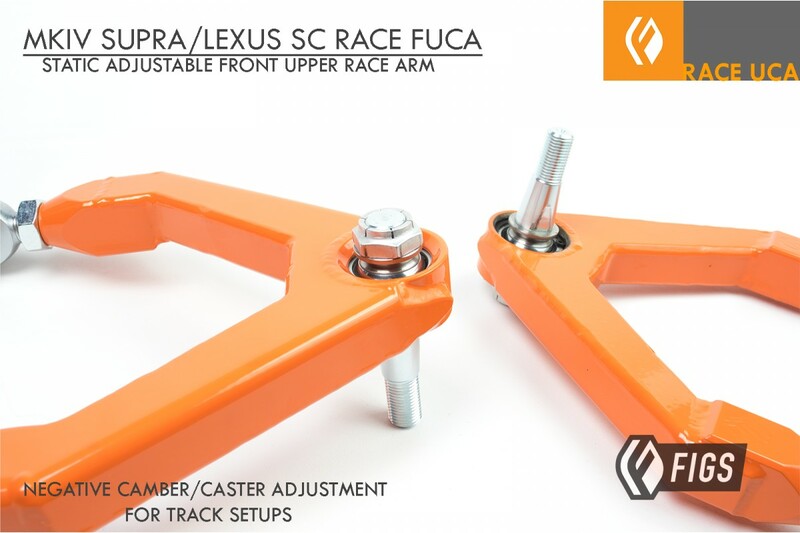 Extreme lowering, Airbag and cup kits, as well as extreme negative camber may require specific product changes and this is much easier to apply changes to our base product before they are manufactured. Thanks for understanding. Lifetime Poly Bushing by SuperPro, 1474K. Spare grease included. USA FK High-strength Precision Rod ends or FIGS MOTO rod ends on inner mount. Precision rod ends feature PTFE liners for long life. Monolithic machined 4140 Chromoly taper stud for highest shear strength. Rolled threads for easy install and torque and extra structural integrity. Made specifically to match the taper of the OE spindle. FK USA Spherical Precision monoball outer joint for idea chock clearance profile and strength. Installs using factory hardware and new M14 lock nut is provided for outer. Boxed 11ga steel construction for favorable strength to weight ratio. 100% TIG welded and made for track duty. Requires ball joint separator to remove the outer ball joint from the factory spindle. Remove castle nut and outer ball joint. Remove inner cross bolt that mounts through the factory bushings. 19mm socket and wrench. Install the ball joint into the spindle first since all adjustment takes place on the inboard side. In order to torque the locknut the taper must be seated into the spin to prevent the stud from turning. The locknut on the TOP of the rod end should not be tampered with as it is there to hold the rod end onto the stud itself. An impact wrench works well to thread the lower locknut until the taper has fully engaged. Then apply final torque of 100-ft-lbs to the locknut. Caster/camber offset: Camber adjustment is done with both inner mounts adjusted at once equally. Caster is adjusted with one mount threaded in and the other mount out. We suggest always counting threads on both sides to assume symmetric adjustment. NOTE: do not expose more than 3/4" of thread beyond the jam nut on the rod end to maintain max rated strength. 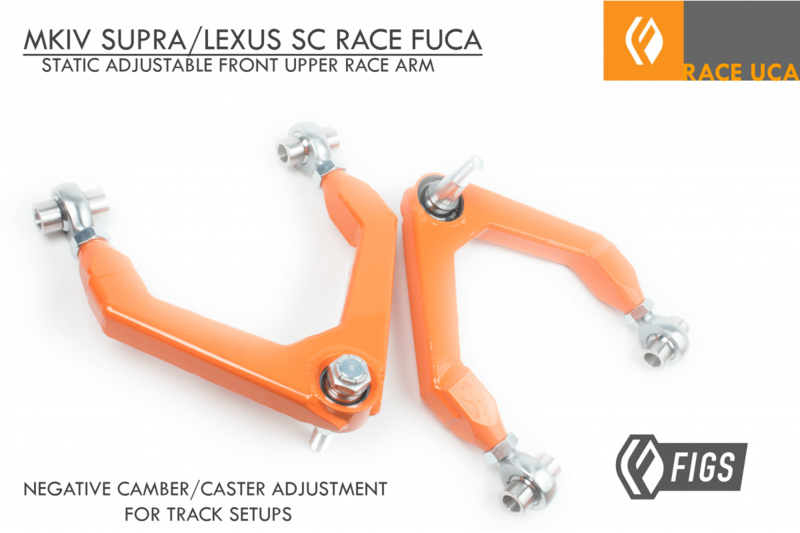 The lower arm will have the fine adjustment for camber, the upper arm is just intended to offer an offset to account for suspension changes or wheel fitment. Reinstall other components as required. Match the number of exposed threads on the opposite side upper arm to achieve balance in both sides of the suspension. Currently these products are preorder and built time is 2-3 weeks depending on the build queue. Circumstance may dictate shorter or longer schedule on product build. Please contact us with any direct questions.